You may be thinking, cooked romaine? Yes! Trust me, or more trust my mom, who I think is the most fabulous self-taught chef ever. I was a little skeptical when she told me about this dish, but she told me that she makes it all the time. It’s an easy and unique recipe, definitely a keeper, especially if you’re looking for some interesting vegetarian recipes. You can make the sauce ahead of time too. I saw these quail eggs at the Chinese supermarket and they were so cute, I couldn’t resist. You can treat them similarly to chicken eggs. Just adjust cooking time because they’re much smaller. 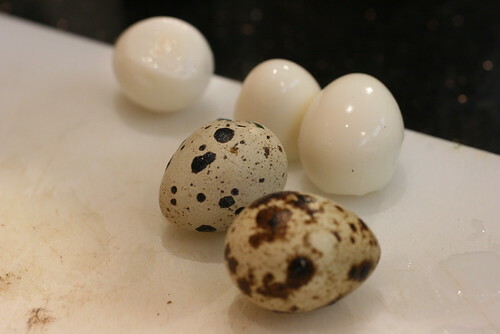 To hard-boil the quail eggs (without getting the green tinge), dunk them in boiling water for 3 minutes, rinse with cold water, then peel.